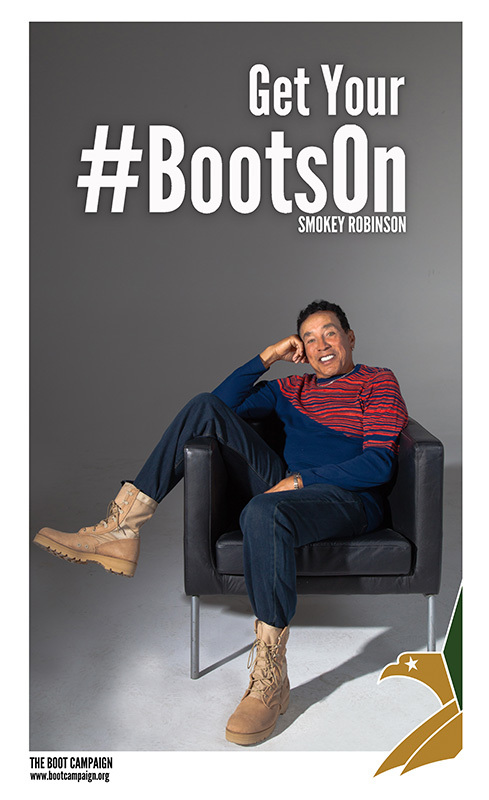 Legendary singer/songwriter Smokey Robinson joined the esteemed list of more than 400 celebrities getting their “boots on” to support the 1.4 million men and women serving in our armed forces today. In his official “boot shoot,” Robinson donned a pair of Boot Campaign signature combat boots and flashed his iconic smile for the camera. As he prepares to be honored for his prolific music career at this year’s BET Awards, Robinson is sharing his appreciation for the sacrifices service members make to keep himself and all of us free to achieve our dreams. The BET network will present the legendary artist with a lifetime achievement award at the 15th Annual BET Awards airing June 28 at 8 p.m. P/C. With a music career spanning 50 years, Robinson is one of the most celebrated artists in music history, credited with largely influencing the development of Motown Records and penning more than 4,000 songs. 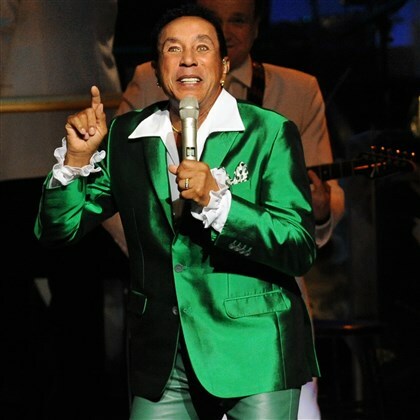 His list of professional accolades is long, including Kennedy Center Honors, the Grammy Living Legend Award, NARAS Achievement Award, the National Medal of Arts Award 2002 presented by President George W. Bush and has been inducted into both the Rock ‘n’ Roll Hall of Fame and the Songwriters’ Hall of Fame. Even with the distinctions and decades of adoration from fans around the world, Robinson expressed his own admiration for the men and women of our armed forces who pave the way for our pursuit of happiness. With Robinson’s support, the Boot Campaign mission to promote patriotism, raise awareness of veterans’ issues and provide assistance for military families of all generations will reach an even greater audience and help even more deserving heroes. The music mogul’s bold display of gratitude for service members is deeply appreciated by both Boot Campaign and the military community, and is just another reason he’s one of America’s favorite icons. Not every artist on the Pittsburgh Symphony Orchestra’s Thursday Night Icons Series quite measures up as icon, but there’s no doubt about the man who kicked it off. Smokey Robinson, one of the brilliant talents who built Motown, launched the series Thursday in a nearly filled Heinz Hall. At 75, he’s just a bit older than the ’60s rockers (Beatles, Stones, Woodstockers) and still exuding a fun, youthful vibe. With “I Second That Emotion,” he tapped into Motown greatness and got to work on a set filled with classics he performed with his Miracles or worked up for one of the label’s other sensations. His voice has always been a soft, silky thing — a quiet storm, if you will. With a band and orchestra behind him, he had a lot to rise above, especially on the groove numbers. He proved it with a medley of “The Way You Do the Things You Do,” “Get Ready” and “My Girl,” spontaneously engaging “the Heinz Hall choir” — the crowd — to make the room rock. One of the faces in the crowd was Franco Harris, whom he saluted down front. For the finale, he reached back for another piece of Motown gold, “The Tracks of My Tears,” going from spare and pretty to big and brassy, and then eased into the long late ’70s slow jam “Cruisin’,” with fans joining him on stage. With timeless songs, stunning vocals and playful showmanship, it was a performance worthy of his spectacular legacy and a concert that set the bar high for the “icons” to come: Johnny Mathis (July 16), Diana Krall (July 23) and Randy Newman (July 30).